At the UN Human Rights Council, China interrupts NGO statement on Tibet. Ambassador Martin Ihoeghian Uhomohbhi of Nigeria, the President of the UN Human Rights Council, this morning [11 September 2008] overruled an attempt by a Chinese delegate to interrupt a statement on Tibet by a German NGO. A member of Society for Threatened Peoples was speaking with reference to the response given by the Chinese authorities to three human rights experts of the Council, including the Special Rapporteur on the situation of human rights and fundamental freedoms of indigenous people on the "alleged severe impact of resettlement programs and forced evictions that are currently being implemented in Tibetan areas of the People's Republic of China (PRC)." 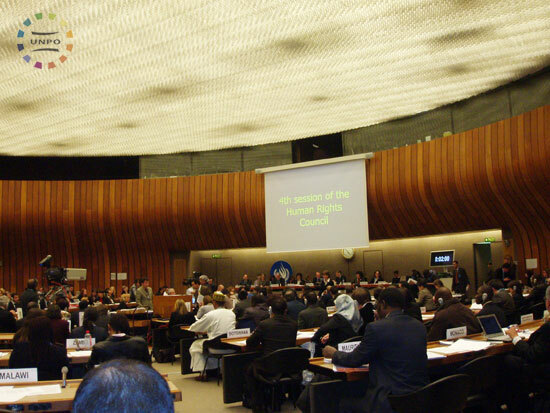 The Ninth Session of the Human Rights Council was having an interactive dialogue on the report submitted to the body. James Anaya, the Special Rapporteur on the situation of human rights of indigenous peoples, in an addendum to his report, called "summary of cases transmitted to Governments and replies received", the Special Rapporteur detailed the 3 October 2007 communication to the Chinese authorities stating: "It was alleged that tens of thousands of Tibetans are being negatively affected by nomad settlement and resettlement, land confiscation and fencing policies, which are mainly implemented in Golok (Guoluo) and Yushu districts of Qinghai province, but also in the Tibet Autonomous Region (TAR) and other provinces that have large Tibetan populations, including Gansu, Sichuan and Yunnan. It was reported that these policies have had a very adverse impact on the traditional lifestyles and living patterns in Tibetan areas, affecting directly the fabric of traditional Tibetan life and devastating the economy of these communities. The implementation of these policies contributes to the challenges that Tibetan cultural and religious identity face today." To this communication which was joined by the Special Rapporteur Special Rapporteur on adequate housing and the Special Rapporteur on the right to food, China responded on 21 December 2007 claiming "a series of projects for the benefit of the people in the Tibetan Autonomous Region (TAR) have been carried out. These projects support and encourage the rapid development of Tibetan economy and society, regenerate and strengthen agricultural and pastoral lands, and improve living and economic conditions of farmers and pastoralists. The Government stressed that, at the same time, it has paid attention to and respected the thoughts of the Tibetan people and supported their traditional lives, customs, and culture. The Government noted that it has received widespread support and favorable comments about the projects from the farmers and pastoralists." [Tenzin S. Kayta, of the Society for Threatened Peoples] while welcoming China's response alerted the Council that the NGO "believe the issue of consent of the Tibetans involved is fundamental. Given the human rights crisis prevailing on the Tibetan Plateau, an independent analysis here would be impossible." The three-minute statement added: "However, a documentary called, "Dispatches-Undercover in Tibet" released this year by Channel 4 British Television revealed that "the nomadic way of life being forcefully wiped out as native Tibetans are stripped of their land and livestock and are being resettled in concrete camps." A representative of the Chinese delegation reasoned that the NGO statement was not relevant to the topic under discussion in the Council to which the Council President ruled that the statement was in order when he even read the first paragraph of the NGO statement. The Chinese delegate then asserted that "Tibet was a part of China and Tibetan people are one of 56 ethnic groups of China" while rejecting notion of the existence of indigenous people in present-day China. "We don't have indigenous people", the Chinese delegate claimed. Society for Threatened Peoples’ intervention also informed the Council about the interview given to the British TV documentary in which a Tibetan evicted from his grasslands says: "Life here is incredibly hard. People are suffering from hunger and hardship. They have no jobs and they have no food, no land. The only way they can fill their empty stomachs is by stealing. Nobody wanted to move here. But if you ask questions dressed like a Chinese, they won't dare to tell you the truth. They will only have good things to say because we live in terror.Its just like living through the Cultural Revolution. Everybody is so depressed, they look awful, their faces have become pale, and their eyes are sunken. Everyone is afraid of speaking the truth. I could be arrested tomorrow if they knew what I've just said." After studying China's response, the Special Rapporteur on the situation of indigenous peoples, observes that he "will continue to closely monitor the situation and called on China "to take the necessary measures to ensure that the development projects referred to do not infringe the human rights of the people affected and that any such adverse impacts be remedied promptly." Responding to China's position that there are no indigenous people in China, Prof. Anaya stated that while he understands the "sensitivities" that many States have on the issue on the coverage of the term indigenous peoples. However, he encouraged "a human rights-based approach, one which looks to the particular issues involved and the human rights dimensions of those issues." "I see issues that are common to indigenous peoples throughout the world and the focus that I will be advancing is one on those particular issues on the human rights dimensions of them as I believe my predecessor did in his communication on the situation of Tibetans in China." Society for Threatened Peoples urged the Special Rapporteur also urged "the Special Rapporteur to closely monitor the situation in Tibet, including by seeking a fact-finding mission to ascertain the fate Tibetans evicted from their ancestral lands."